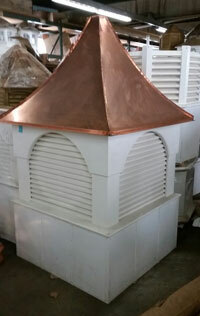 << Back 48 vinyl Large LOUVERED cupola,can be purchased with or without clock(s). 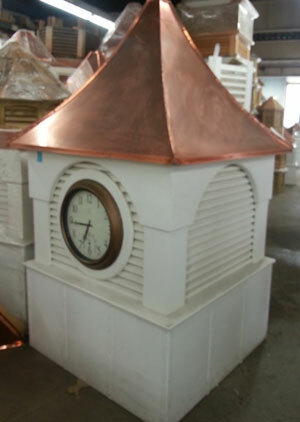 BEAUTIFUL VINYL LOUVERED CLOCK CUPOLA,WITH copper STANDING SEAM PAGODA STYLE ROOF.WEATHERVANE READY.48'' WIDE BY 78'' TALL.BASE SIZE 42'' SQUARE.THIS BASE WILL FIT UP TO A 10/12 PITCH. 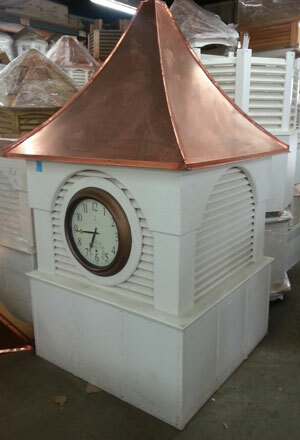 THIS CUPOLA MEASURES 78'' TALL BY 48'' WIDE AT THE PAGODA COPPER ROOF.EXTREMELY WELL MADE ITEM. 48 vinyl Large LOUVERED cupola,can be purchased with or without clock(s).